He and his wife came into the limelight with CRISIL Limited. At the end of April 2005 he was holding 14.26% o f the company, accounting for Rs 70 crore. In the same year the couple made Rs 27 crore after they sold out to the S&P open offer at Rs 775 per share. In India, bull runs have been associated with certain individuals. 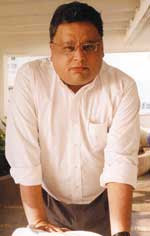 In the nineties it was Harshad Mehta and in early 2000 it was Ketan Parekh. But Jhunjhunwala does not like to be associated with any booms. He believes that the market is above individuals. “The market is rational. An individual can never be smarter than the market”, he says. For your information, some his portfolio constituents are: Titan Industries, Praj Industries, Aptech, Lupin, CRISIL, Nagarjun Construction, Geojit and 10 more. He is an expert in picking value stocks when no one is noticed them. He invested in stocks like BEML and other PSU Stocks when everyone looked at technology stocks in early 2000. Confine your portfolio to 15-20 stocks. Invest for long term to get good returns. To get exceptional returns, you need to take risks. He generally stays away from commodity stocks and index stocks. But he recently bought some steel stocks. Like Jack Welch of GE, he believes in extensive reading and learning. Be an optimist. Pessimistic investors always lose money in stock markets. If you believe in the growth prospects of a company, invest in the stock and give it sufficient time. Greedy investors will never make money in stock markets. Book profits after reaching your target price. Never put your hard earned money without proper research. Never invest according to Stock tips. You have to lose many a battle to win the war. This Winston Churchill quote is always quoted by Jhunjhunwala. Balance fear and greed. Stock markets are always right. Never time the markets. Prepare for losses. Losses are part and parcel of stock market investor life. Learn from mistakes. Learn to take a loss. * "Markets are like women -- always commanding, mysterious, unpredictable and volatile,"
* Anticipate trend and benefit from it. * Don’t insult the great man (Warren Buffett) by comparing me to him. * Successful investors are opportunistic and optimistic ones. * Growth comes out of chaos. * Emotional investment is a sure way to make loss in stock markets. * Be happy with your gains but learn to accept losses with a smile. * Be opportunistic but wait for the right moment. * Study the market thoroughly. Refer to history. * Asked how much patience should an investor have, Jhunjhunwala said, "Get married and you will understand how patient you need to be." * "If in doubt, listen to your heart". * Have an independent opinion, always. * Panic selling during a sharp fall is the worst thing to do. "The market," he says, "is always right. Markets cannot be taught, they have to be learnt." 1 - Always remember that "Indian Markets are THE MOST MANIPULATED MARKET in the World. 3 - RJ is just like a small kid on the block, there are Fathers and Grand Fathers of RJ in the Market about whom just extremely few people know about !! 5 - Learn sincerely Technical Analysis and use it objectively, you will SURELY BE ABLE TO SAVE YOUR PROFITS AND HARD EARNED CAPITALS. My ALL THE BEST WISHES for Small and Honest and Marginal Traders and Investors of INDIA.